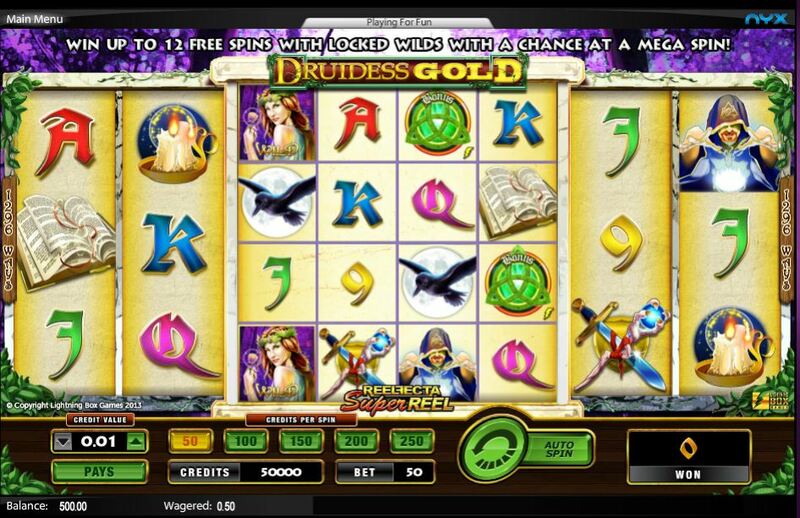 Druidess Gold slot is quite simply like nothing I have seen before. Lightning Box seem to have departed here from their usual Redroo or Silver Lion type 1024-way games with multiplying bonus Wilds and gone for a completely different concept! Not only is the Druidess theme unique but the design of the game too as we will see. Your reels are set over a dark forest background and symbols of wizardry and magic spin to the tune of a classical fairytale musical score, but will this mysterious maiden be offering up her gold to us? Before we see the pays the reels will immediately catch your attention with their odd format - you have two reels of 3 rows either end with a giant 4x4 'Reelfecta' centre reel which acts as a 16-row reel. You therefore have a 1296-way slot with no pay lines and the centre 4x4 area is actually 16 separate single-icon reels. So for example to get a 5-of-a-kind 9's win you'd need one on each of the outer 4 reels and one anywhere in the centre grid, more than one there would therefore award multiple 5-of-a-kind '9' wins. The icons are all single and the Druidess is the Wild although she will only appear on the Reelfecta and reel 4. The hooded Wizard is the best pay at 5x your 50-coin bet for a full 5, the Raven 3x, Book of Spells 2x, Sword or Candle 1.5x with 5 card values paying either 40 or 25 coins for a full way. There are green Magic Orbs that can appear around the outside perimeter or 'Ring' of the 4x4 Reelfecta and these are necessary for our interesting bonus game. You need to to see 5 or more Orbs land in the 12 positions on the edge of the Reelfecta grid to trigger a weird and wonderful bonus. Nine or more will award the top pay of 500x bet too. You will see 3 free games for your trouble and on each of these a Golden Druidess Wild will appear in this Ring of Perfection starting in the top left and going clockwise. There is also a poison bottle that can land in the Ring but not in the first 3 spins, this will end the free games. From the third spin her appearance adds one extra spin and so-on. This serves two purposes as you have a growing number of sticky Wilds for each subsequent spin and therefore any 3, 4 or 5-of-a-kind wins will have their ways equal to the number of Wilds. The grand finale is the second purpose as if you should fill all 12 positions with the Golden Druidess Wild and miss the poison you get a final 'Mega Spin'. The centre 4 squares fill with Wilds too and you get a final spin with the whole grid filled with a block Wild, effectively one spin with a 16x multiplier. Now you may remember the Wizard is the top icon paying a mere 5x bet, so 80x is the maximum award here but you will have accumulated wins previously on all the spins with 9, 10 and 11 Wilds in place etc.